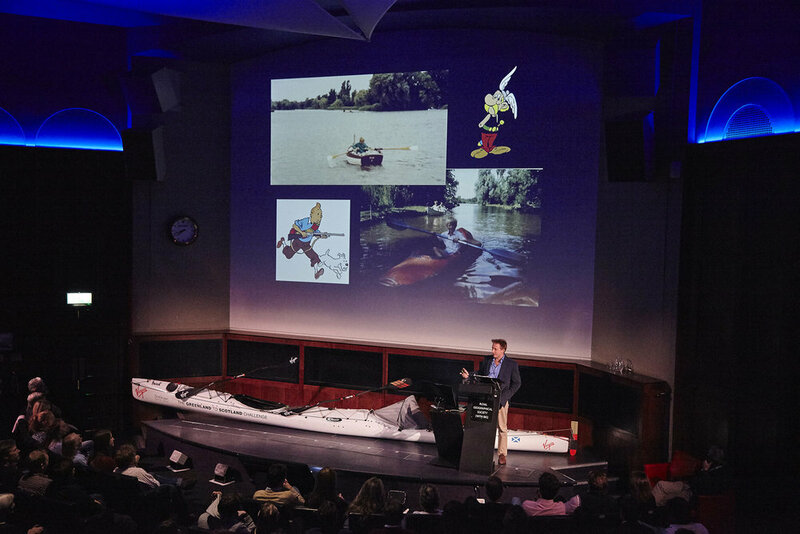 Olly’s epic Ocean voyages have led to his involvement with hundreds of speaking events, conferences, festivals and lectures worldwide. Olly speaks on motivation and achieving seemingly impossible goals, the rewards of perseverance in the pursuit of dreams, and of finding the positives in failure as well as success. Olly is witty and understated, and gives a fascinating insight into what drives him to achieve his goals and the lessons he has learnt along the way. How Olly deals with fear and loneliness, success and failure will resonate with audiences from all walks of life. Equally comfortable delivering a keynote speech for a multinational or a prize giving at a school Olly will work with you to create just the right message and pitch for your audience and leave them all realizing that we can achieve whatever goals we set our minds to. 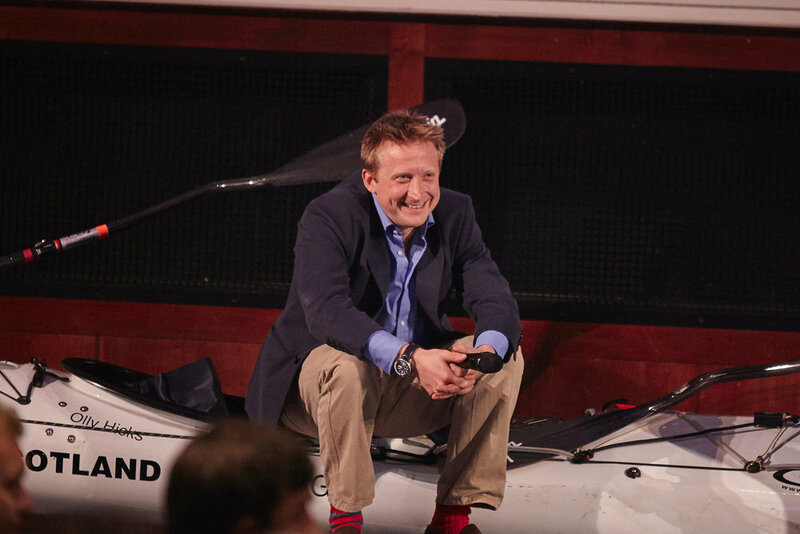 As a major sponsor of Olly's spectacularly courageous & original first attempt to circumnavigate the bottom of the world we were treated to an incredibly inspiring talk from 'Team Hicks'. George Olver, Olly's right hand man for the expedition & Olly via Satphone gave us all a wonderful account of how Olly was driven to take on this monumental challenge and how Olly prepared himself in the days, months and years leading up to this. We had the pleasure to listen to Olly’s lively description of the Virgin Atlantic trip; he did a great job in sharing with us the difficulties and the positive moments of his project. Everyone was amazed at the thought that such a young-not impressively built ;-) person could achieve such a performance! Olly has done extraordinary things in pushing the boundaries of both physical and mental endurance. His inspiration for others, whether involved in sport, adventure or business, is that he speaks about his achievements in such a beguiling and understated way, you are left truly believing that you can do it too - that you can excel in your chosen field. This is a powerful and empowering message. Olly had the children enthralled as he presented fascinating tales of his various expeditions to date. A sure sign that the children were gripped by it all was the number of questions that followed - which would have gone on for the entire morning had they had the chance to! Very many thanks, Olly, and all the best for the next expedition! We look forward to welcoming you back to the school hopefully in the near future. Good speakers have good stories to tell and there is no doubt that Olly Hicks tells a good story - a story in which he is, for the most part, the only character, along with Neptune, god of the sea!! It is a story of vision, determination, endurance and well worth listening to. I would have no hesitation in commending him as an entertaining, challenging and engaging speaker - with a very good story. Kept on the edge of our seats Olly Hicks gave an inspirational talk tailored to the audience. His enthusiasm and passion shone through making it clear that anything falling short of success was not an option for him. Thank you very much and best of luck with your next voyage. A thoroughly engaging and amusing speaker, whose dry, self-deprecating delivery belies the courage required for his incredible quests. Highly recommended! Olly was exactly what we wanted. He gave an amusing and interesting insight into his personal achievements and his determination to succeed. He was extremely pleasant and polite ..and captivated the audience with his presentation. I would not hesitate to recommend him to others and would like you to pass on our thanks to him for his contribution to a successful evening. Olly was a wonderful ambassador for The Black Grouse, bringing inspirational and interesting stories from his career to the lively discussions at our events which were for audiences across the UK. We would not hesitate to work with Olly again and can’t wait to see what the next chapter of adventures holds. Your talk was not only engaging, informative and incredibly inspirational, but also very relevant in terms of some of the qualities that our pupils will need once they leave Secondary School. Following your visit, many of the pupils (and Staff!) commented on how much they enjoyed your talk. Your presence was inspirational and your speech, from my perspective, could not have been better judged. The boys were kept transfixed throughout and so were the Parents. The boys have been buzzing about you as a person as well as the ‘madness’, though accompanied with great courage, that must accompany taking on the challenges you undertake. Parents have not had anything other than the most generous praise for the school through having captured someone who provided the boys with such motivation to seek to be themselves, dream and take up challenges. These comments have been tempered by a hope that their sons seek less life threatening dreams to pursue as rowing oceans. A better role model would be hard to find! We have recruited a lot of great speakers for our events but Olly Hicks was one of the best. For someone who spends so much time on his own in the middle of an ocean, he was one of the most communicative, funny, understated and truly inspirational people I have ever met. – Duncan McRae, Founder, Flying Colours.